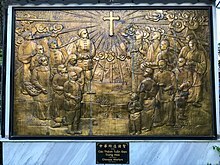 Many died in the Boxer Rebellion, in which anti-colonial peasant rebels slaughtered 30,000 Chinese converts to Christianity along with missionaries and other foreigners. While Catholicism continued to exist and increase many-fold in areas beyond the government's control (Sichuan notably), and many Chinese Christians fled the persecution to go to port cities in Guangdong or to Indonesia, where many translations of Christian works into Chinese occurred during this period, there were also many missionaries who broke the law and secretly entered the forbidden mainland territory. They eluded Chinese patrol boats on the rivers and coasts; however, some of them were caught and put to death. A new period of persecution in regard to the Christian religion occurred in the 19th century. While Catholicism had been authorised by some Chinese emperors in the preceding centuries, the Jiaqing Emperor published, instead, numerous and severe decrees against it. The first was issued in 1805. Two edicts of 1811 were directed against those among the Chinese who were studying to receive sacred orders, and against priests who were propagating the Christian religion. A decree of 1813 exonerated voluntary apostates from every chastisement – that is, Christians who spontaneously declared that they would abandon their faith – but all others were to be dealt with harshly. 10. 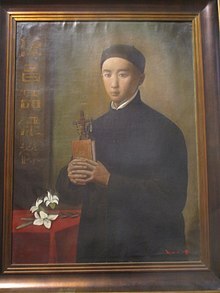 Saint Joseph Yuan, a Chinese diocesan priest. Having heard Monsignor Dufresse speak of the Christian faith, he was overcome by its beauty and then became an exemplary neophyte. Later, he was ordained a priest and, as such, was dedicated to evangelisation in various districts. He was arrested in August 1816, condemned to be strangled, and was killed in this way on June 24, 1817. 16. Saint John Gabriel Perboyre, C.M., entered the Vincentians as a high school student. The death of his younger brother, also a Vincentian priest, moved his superiors to allow him to take his brother's place, arriving in China in 1835. Despite poor health, he served the poverty-stricken residents of Hubei. Arrested during a revival of anti-Christian persecution, upon imperial edict, he was strangled to death in 1840. In June 1840, Lin Zexu, the Imperial Commissioner of Guangdong, wished to abolish the opium trade that was being conducted by the British, and had more than 20,000 chests of this drug thrown into the sea. This had been the pretext for immediate war, which was won by the British. When the war came to an end, China had to sign in 1842 the first international treaty of modern times, followed quickly by others with the United States and France. Taking advantage of this opportunity, France replaced Portugal as the power protecting the Christian missions. Following on from this, a twofold decree was issued: one part in 1844 which permitted the Chinese to follow the Catholic religion; the other, in 1846, with which the old penalties against Catholics were abolished, and restored the property taken in 1724. The 1844 treaty also allowed for missionaries to come to China, but they were only permitted to come to the treaty ports opened to Europeans; this fact was used as a legal justification for the execution of Augustus Chapdelaine (mentioned above). In the mid-19th century there was a civil war in China known as the Taiping Rebellion, during which a Hakka Chinese Christian, Hong Xiuquan, claimed to have received a special mission from God to fight evil and usher in a period of peace. Hong and his followers achieved considerable success in taking control of a large territory, and they destroyed Buddhist and Taoist shrines, temples to local divinities and opposed Chinese folk religion. The war was very costly in lives, accounting for perhaps 20-30 million deaths, thus making it the second bloodiest conflict in human history (after World War II). After the rebellion was crushed, the aftermath of the catastrophe led to Christianity acquiring a bad name, due to its association with the rebellion. This helped provoke violence against missionaries. Violence against missionaries during this period was also provoked due to the increasing association between missionary activities and foreign imperialism, including in relation to French imperialist activities in China that were conducted under the banner of protecting the missions. From then on the Catholic Church could live openly and carry out its missionary activity, developing it also in the sphere of higher education, in universities, and in scientific research. With the multiplication of various top-level cultural Institutes and thanks to their highly valued activity, ever deeper links were gradually established between the Catholic Church and China with its rich cultural traditions. Catholic missions offered protection to those who came to them, including criminals, fugitives from the law, and rebels against the government; this also led to hostile attitudes developing against the missions by the government. It is known that mingled in this rebellion were all the secret societies and the accumulated and repressed hatred against foreigners in the last decades of the 19th century, because of the political and social changes following the Second Opium War and the imposition of the so-called unequal treaties on China by the Western Powers. Very different, however, was the motive for the persecution of the missionaries, even though they were of European nationalities. Their slaughter was brought about solely on religious grounds. They were killed for the same reason as the Chinese faithful who had become Christians. Reliable historical documents provide evidence of the anti-Christian hatred which spurred the Boxers to massacre the missionaries and the Christians of the area who had adhered to their teaching. In this regard, an edict was issued on July 1, 1900, which, in substance, said that the time of good relations with European missionaries and their Christians was now past: that the former must be repatriated at once and the faithful forced to apostatize, on penalty of death. They were killed together on February 25, 1930, at Li-Thau-Tseul. Following the failure of the Boxer Rebellion, China was further subject to Western spheres of influence, which in turn led to a booming conversion period in the following decades. The Chinese developed respect for the moral level that Christians maintained in their hospital and schools. The continuing association between Western imperialism in China and missionary efforts nevertheless continued to fuel hostilities against missions and Christianity in China. All missions were banned in China by the new communist regime after the outbreak of the Korean War in 1950, and officially continue to be legally outlawed to the present. Herbermann, Charles, ed. (1913). "Martyrs in China" . Catholic Encyclopedia. New York: Robert Appleton Company.